I have heard a lot said on the subject of pronating and supinating in the golf swing.The pronator muscles in our forearms turn our hands palms down from the elbows and the supinator muscles in our forearms turn our hands palms up from the elbows. Both with no turn in the elbows (shoulders). In the golf swing as the rule these muscles are simply stabilizer muscles. Even though"some" may start their back swing with this forearm rotation, arm turn from the shoulder quickly catches up in the back swing. Try this. In a standing position hold your left arm straight out and level in front you with your thumb up. With a relaxed arm turn your hand clockwise from your elbow so your thumb now points straight to your right. Swing your arm right well past your right shoulder and then bring it back to the straight out position. Now if you turn your arm from your shoulder so your thumb points up again you will find your arm in the original straight out position. I'm sure we do rotate the forearms at times, to increase a draw or a fade maybe to add or subtract a little height to a shot. Flipping the clubface at impact may be the result of supinating the left and pronating the right into impact, rather than a full arm turn. Any ways I am trilled to have this forum to discuss this and the many other golf related topics. That helps me understand what happens at impact when you flip. I don't think flipping is the result of what you describe though. It's the definition. What causes the flipping is more important imo. 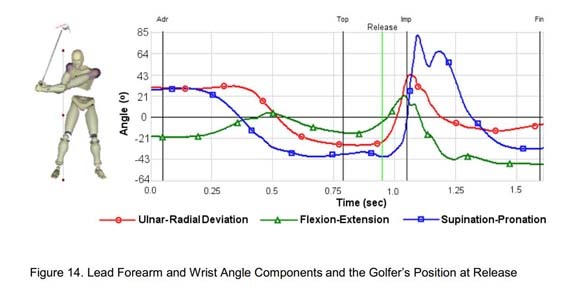 Forearm supination and pronation has been measured in golf swings. And it's not just for flipping the club with the typical definition of having a cupped lead wrist through impact and increasing the club's dynamic loft versus the look of lag which decreases dynamic loft - flipping is a wrist issue not forearm - golfer's can flip in a number of ways - early cast leading to club head passing the hands before impact or getting stuck and with an open club face so you get the classic body stall/flip to square the face. DEFINING flipping is the first order of business. The term is used by many to describe differing movements such as “scooping” (a wrist hinging motion) and “rolling” (a forearm rotational motion). How about using the terms “scoop flip” and “roll flip”? And since both conditions can occur in the same swing since they are independent actions, maybe that’s a “combo flip”? lol. DEFINING flipping is the first order of business. The term is used by many to describe differing movements such as "scooping" (a wrist hinging motion) and "rolling" (a forearm rotational motion). How about using the terms "scoop flip" and "roll flip"? And since both conditions can occur in the same swing since they are independent actions, maybe that's a "combo flip"? lol. My main focus now is making sure the left arm supinates fully thru impact and it is working really well. The timing of ulnar deviation is dependent on how much and when you ****(radial deviate) the wrists going back. 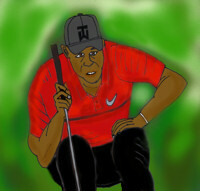 Pros have a later release than amateurs because they start down with their lower body while their shoulders and arms are still turning back with their wrists being fully cocked by the weight of the clubhead, NOT because of any holding action of the wrist ****. Supination /pronation- -a forearm action- rotating the forearms or rolling the forearms resulting in the palm turning up(supination) and turning down(pronation)- Because the hands are basically facing each other on the grip,pronating one forearm causes the other forearm to supinate. Although pronation /supination are forearm actions they do directly affect the wrist bone. Pronating the left forearm during the backswing will help to get the clubface on plane and will open the clubface. Since supination/ pronation are factors in closing the clubface almost all golfers have some some degree of supination/pronation in the lower downswing. Those who have the least tend to have the most torso rotation at impact. Forward shaft lean is a result of the the hands being ahead of the clubhead at impact.This requires that the right wrist be in flexion(wrist moving towards the back of the hand with the left wrist being either flat or in extension( bowed). FLIPPING is the opposite of the last two lines with the right wrist being flat or bowed and and the left wrist being in flexion. It will close the clubface and usually is associated with a straight right arm in the impact zone. It a necessary action when the arms are blocked by the body and is often accompanied by a stall of the hips. A flip occurs when the club head passes the hands prior to impact. The result is added loft to the club face and the club head slows down after it passes the hands. A guy who used to post on here all the time, his name was RussC, used to post very similar thoughts. OP you might want to look for some of Russ's old posts because he was a gold mine of great information. Would you agree that you need more lead arm supination with irons, and less with driver? Or am I way off base. This video is saying the the pro's supinate slower but longer than amateurs. I knew about the longer part, but not the slower part. That is a bit eye opening. Your definition of flipping is scooping or a “scoop flip”. However, many pros also use the term “flipping” to define a quick rollover forearm move through impact or a “roll flip” ... think TGM finish swivel occurring at impact. Just trying to get everyone on the same page! VERY IMPORTANT - Because the ball is on the ground and the attack angle is steeper, the LOW POINT of the swing arc is in front of the ball.More so with wedges than long irons. Because of these factors ,the body has more overall tilt than with irons. The low point with a driver is at or slightly behind the ball. That means that the ball is struck further up in the swing arc. My conclusion is because the driver swing has a longer flat point beyond impact,there is probably more supination than with an iron swing but my confidence level with this conclusion is not high.If someone else can make the opposite argument I will change this post. Your definition of flipping is scooping or a "scoop flip". However, many pros also use the term "flipping" to define a quick rollover forearm move through impact or a "roll flip" ... think TGM finish swivel occurring at impact. "Flip" has a connotation of being a swing error.In my definition of a flip,there is little to no forward shaft lean,which is a definite error. Flipping via rolling the forearms is not necessarily an error ,but can contribute to inconsistency because of the high rate of closure . This is only a FEEL, but it feels like when I supinate more fully, the hands are automatically moved forward which is great for short irons. So less supination means hands back a bit, which is better for driver. But again this is only a FEEL I have, I am not sure if its reality. Not sure if anyone can confirm the supination increases the chances of the hands moving forward. If talking about a straight ball flite with matching trajectory to your club. I do not believe there is any pronation or supination to this golf swing, a twisting of the forearms. The turn of the arms is a one piece turn from the shoulders (the head of humerus bone). The function of the left arm in the golf swing starting with a neutral grip in set up, is square to the target line and has no turn to it. In the back swing the left arm turns and rotates to plane. It retains that turn into the down swing and returns to square (no turn) at contact. 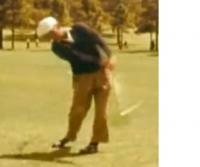 In the follow though the left arm remains unturned as it is now on the turn side shoulder. It simply buckles up from the elbow. Same as the right arm does not turn in the back swing. 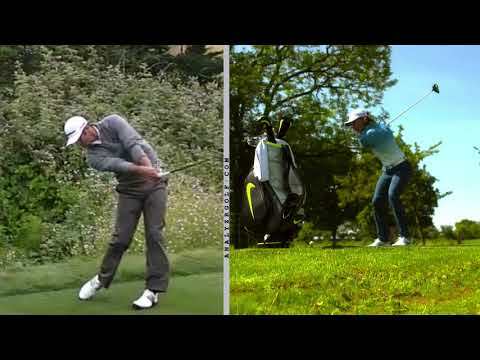 If you take a back swing and stop at the top, let go with your right hand, now turn your shoulders back to set up position without turning your arms. From here if you unbend your right arm it will return to your set up position. Hands ahead or behind at contact with a square no turn in the arms is achieved by our wrist flexion and extension (bending forward or back). Take your set up position with neutral grip, use your wrists to swing the clubhead straight back and forward. Notice how the club face stays square. The longer the club the farther the reach to square can be. The hands should work mostly up and down not side to side. The pivot takes care of the forearm rotation. 1. Ulnar deviation: starting with lower body has nothing to do with the delay of UD but a fast downwards throw towards the trail foot initiated with both elbows, elbows pulls wrists down the momentum delays UD. UD accelerates the grip which snaps the clubhead towards the ball hence maximise ball speed. Try it yourself. The faster you pull the elbows down without moving the wrists the faster the hip rotation, thats how pros are perceived to start with their lower body. 2. Supination of the lead forearm. Again this is a consequence not a concious movement. Its a result of minimal weight shift to the lead foot at the time of impact (have a look at bobby lopez’s onside 2’ clock drill) so lead elbow is straightened by the upwards and backwards movement of the lead shoulder right after impact, the lead shoulder also pulls the grip and directs trail hand to be in front of the leadhand. With the straightened lead shoulder and trail hand moving in front, lead forearm has to supinate. Too much weight shift or upper body shift to the lead side reduce the amount of supination, or a hold on full release of the wrist.